In this article we shall cover experiment 1 and experiment 2 discussed in the last article - i.e. we start with the upper left corner of the drawing. This experiments creates the dotted line between netns1 and netns2. Though simple this experiments lays the foundation for all other experiments. We create a separate network (and uts) namespace with the "unshare" command and background processes. This works through the a separation of the uts namespace. See the first post for an explanation. Note, that we can use PIDs to identify the target network namespaces! Explicit names of the network namespaces are not required! The lo device is required (in UP status) to be able to ping network interfaces (here e.g. veth11) in the local namespace! This is standard: If you do not specify the interface to ping from via an option "-I" the ping command will use device lo as a default! The ping traffic runs through it! Normally, we just do not realize this point, because lo almost always is UP on a standard system (in its root namespace). PING 192.168.20.2 (192.168.20.2) from 192.168.20.1 : 56(84) bytes of data. Our direct communication via veth works as expected! Network packets are not stopped by network namespace borders - this would not make much sense. This is a standard way to connect containers on a host! A separate 3rd namespace gets the the bridge and related firewall and VLAN rules outside the control of the containers. But a separate namespace also helps to isolate the host against any communication (and possible attacks) coming from the containers! The bridge has to be set into an UP status. The veth interfaces located in netns3 do not get an IP address. Actually, a veth interface plays a different role on a bridge than in normal surroundings. The bridge itself does not get an IP address. By attaching the veth interfaces to the bridge we create a "port" on the bridge, which corresponds to some complicated structures (handled by the kernel) for dealing with Ethernet packets crossing the port. You can imagine the situation as if e.g. the veth interface veth13 corresponds to the RJ45 end of a cable which is plugged into the port. Ethernet packets are taken at the plug, get modified sometimes and then are transferred across the port to the inside of the bridge. However, when we assign an Ethernet address to the other interface, e.g. veth11 in netns1, then the veth "cable" ends in a full Ethernet device, which accepts network commands as "ping" or "nc". No IP address for the bridge itself! happens in the background. However, I do not like this kind of implicit politics, because it opens ways into the namespace surrounding the bridge! And it is easy to forget this bridge interface both in VLAN and firewall rules. Almost always, there is no necessity to provide an IP address to the bridge itself. 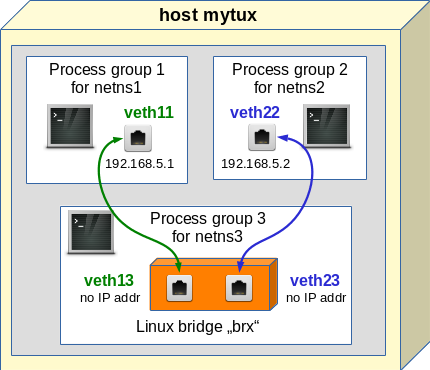 If we need an interface of a namespace, a container or the host to a Linux bridge we can always use a veth device. This leads to a much is much clearer situation; you see the Ethernet interface and the port to the bridge explicitly - thus you have much better control, especially with respect to firewall rules. Now we open a terminal as a sub shell (as we did in the previous example) and enter netns3 to have a look at the interfaces and the bridge. and grep the line for a specific interface. Note that - as expected - we do not see anything of the bridge and its interfaces in netns1! Note that the bridge basically is a device on the data link layer, i.e. OSI layer 2. In the current configuration we did nothing to stop the propagation of Ethernet packets on this layer - this will change in further experiments. It is pretty easy to connect network namespaces with veth devices. The interfaces can be assigned to different network namespaces by using a variant of the "ip" command. The target network namespaces can be identified by PIDs of their basic processes. We can link to namespaces directly via the interfaces of one veth device. An alternative is to use a Linux bridge (for Layer 2 transport) in yet another namespace. The third namespace provides better isolation; the bridge is out of the view and control of the other namespaces. We have seen that the commands "ip a s" and "bridge link" are useful to get information about the association of bridges and their assigned interfaces/ports in network namespaces. Dieser Eintrag wurde veröffentlicht in Linux-Container, Netzwerk und verschlagwortet mit container connection, Linux bridge, network namespaces, veth devices, virtual bridge, virtual networking von Ralph Mönchmeyer. Permanenter Link zum Eintrag.